The exhibition is made of twenty charts that present: i.a. documents and photos illustrating the history of the Polish and Jewish community in Markowa, as well as the reality of the German occupation in Poland, where anyone who helped Jews was threatened with death penalty.The authors of the exhibition, taking the tragic history of the Ulma family as the starting point for their narrative, describe other examples of rescuing Jews (also in Markowa, where Poles saved 21 lives) and present, for example, the map of the localities in the Podkarpackie region, where Jews were harboured by Poles. Józef and Wiktoria Ulma during the German occupation were hiding at their house in Markowa eight Jews: five men from the Goldman family from Łańcut, and three women, residents of Markowa – Lea Didner with her little daughter, and Golda Grünfeld. They were denounced to the German authorities. As a result, all the Jews hidden by the Ulmas were killed. The rescuers: Józef Ulma, his wife Wiktoria (who was in late pregnancy), as well as their six small children, also lost their lives. 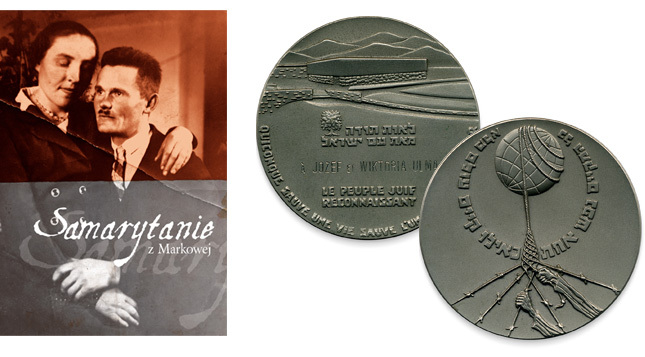 The closing elements of the exhibition are the documents from the Ulmas’ beatification process and the diploma certifying that Wiktoria and Józef were awarded the “Righteous Among the Nations” title.